Teaching for Meaning & Purpose The Lois Walters Coker Lecture Series presents Dr. Bryan Dewsbury’s “Teaching for Meaning & Purpose.” The event will be Thursday, March 28th beginning 7 p.m.-9 p.m. at The Elizabeth Boatwright Coker Performing Arts Center, 300 E. College Ave., Hartsville. This event is free and open to the public. Eastside Christian Academy Spring BBQ Sale Eastside Christian Academy will be having a BBQ sandwich sale on Friday, March 29th from 10:30 a.m. until 6 p.m. The location of the sale is 201 McFarland Street. For more information, you may call 843-332-6251 or 843-332-6295. Lamar Egg Scramble Jamboree Established in 1983, the Lamar Egg Scramble Jamboree is an annual tourist driven festival located in downtown Lamar that brings people from throughout the region to enjoy a weekend of fun filled activities. The Jamboree will be held Thursday, April 4th-Saturday, April 6th. Come out and enjoy the fun! GSSM STEM Summer Camps iTEAMS XTREME Next Generation for rising 6th, 7th, and 8th graders. Work in teams to program microcontrollers and robots and explore digital communications between linked hardware and the internet of things. June 10th-13th, GSSM campus, Hartsville. Christian Recovery New Meeting Location Due to construction at The Player House, Christian Recovery has moved its meeting to New Providence Baptist Church, 1884 Antioch Road at the corner of North Center Road. The meeting is every Thursday at 7 p.m. All those struggling with addiction and family members are welcome. 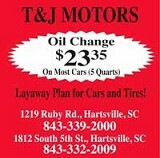 For more information, call 843-993-5222 or 843-307-7193. City Council meeting Hartsville City Council holds regular council meetings on the second Tuesday of each month at 5:30 p.m. in Council Chambers, found on the first floor of City Hall, 100 East Carolina Ave. Notification of special meetings is provided at least 24 hours in advance, and agendas are posted in the alcove outside of Council Chambers. Brain Injury Support Group The Hartsville Brain Injury Support Group meets the second Tuesday of each month at the Hartsville Memorial Library. 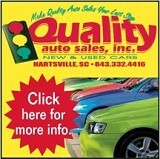 For more information call Danny Weaver at 843-861-5413 or Monroe White at 843-615-5378. Girl Scout meetings What did you do today? Become a girl scout and join the fun! Create. Make friends. Camp. Sing. Explore new places. Try new things! Become a leader. Make a difference! Girl scout meetings are the second and fourth Sunday from 3-5 p.m. Troop 029 at St. Luke United Methodist Church, 302 Dunlap Dr., Hartsville. Troop Leader is Ms. Ann Boone, 843-858-7821. Girls grades, K5-12th. American Legion Post 53 American Legion Post 53 invites all veterans to come join us and enjoy a meal on the third Tuesday of each month at 6:30 p.m. For more information please call Mike Jackson at 443-532-4911 or Jim Ousley at 843-332-9340.